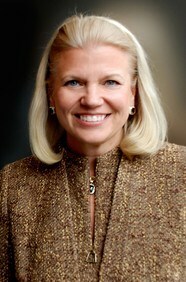 Home / leadership / IBM CEO Ginni Rometty believes big data and social will change everything – how about other CEOs? Speaking at a recent event in the US, and as reported by Forbes, Ginni Rometty, CEO of IBM believes that big data, social, and data analytics are the 3 areas which will give companies a competitive advantage. She believes it will change how decisions are made, how value is created and how value is delivered. “Many more decisions will be based on predictive elements versus gut instincts,” Rometty said. With the incoming “tsunami of information,” Rometty believes that those companies that are able to use data to their advantage will make better, more objective calls. I agree with Rometty’s description of a “tsunami of information” – because it has become just that. You can watch her speech in full below. Her speech begins at the 5:47 mark. Twitter alone generates 1 billion tweets every 3 days (correct as at March 2013) and this number is only set to increase. At Kred, we have collected over 150 Billion tweets since 2008 and we see first-hand just how rapidly networks like twitter are growing in terms of data. “social media is the best piece of market research you never commissioned“. Again, Rometty’s words are preaching to many of the people reading this post. What I took away from her assessment was that sharing within companies will become more important. I predict shortly we might see a component of your next performance review addressing just how well you are sharing knowledge internally. Today we see very publicly how social media is being used by consumers to communicate and engage with brands. What is not so visible however (unless you work in a large company who has deployed an enterprise social network such as Yammer or Chatter), is the incredibly powerful way internal information is generated and can be shared – benefiting not just employees, but also customers. IBM’s CEO gets it – why don’t other CEOs have social on their agenda? When large companies such as IBM have their CEO specifically calling out social as a key driver for business growth and innovation, you just know that it has reached the boardroom. The challenge though is how do you harness the fact that social is now on the CEO’s agenda and drive real change into and across an entire organisation? Talking about “doing social” in the boardroom may still not translate that far into the organisation unless those in the c-suite really understand first-hand about the transformational power of a social business. In an upcoming series of posts, I will be reviewing a recent report from Altimeter group by Charlene Li and Brian Solis titled “The Evolution of Social Business”- it is a well thought out and comprehensive report and I encourage you to download and read it. Despite the initial funding that created their positions, many social strategists we interviewed felt that without deep executive support, they didn’t have the validation, direction, and resources to move beyond tactical efforts. The report goes on to explain that “part of the challenge is that executives don’t understand social media’s potential for business impact — primarily because they have not experienced social media themselves”. The crux of the matter is one of familiarity with social tools. The report found that in organizations where executives do not use social technologies, social media as a business tool is often limited in reach and understanding within the organization unless a business case is made. That last paragraph could rule out any real progress towards becoming a social business unless the c-suite truly gets social and how it can be used to drive business growth and meet a company’s objectives. I firmly believe that “to get digital you need to be digital“. This is not a criticism of executives today – many will never step outside their current mode of operation and embrace Facebook or Twitter – it’s just not their style. As I opined way back in 2001 in a paper delivered to the Rotary Club of Sydney titled “who will navigate today’s leaders through the e-commerce minefield?“, today’s executives could be well served by “digital mentors”, or an even more radical thought, choose digital-non executive directors to supplement those on the board or the executive team to whom social media remains a mystery. If you change every reference to “ecommerce” to “social” and the paper it still resonates in 2013. I am an absolute believer in the transformational power of social, it does however need to be paired with an absolute commitment from the top. I am heartened to hear from the likes of Ginni Rometty and Angela Ahrendts talking confidently about social’s place in the enterprise. I think we need to hear more about social business and not just social media. As an aside, I am yet to see someone call themselves a “social business guru”, but then 2013 is still young. Great insight Andrew. Interesting stats from the Altimeter report that only 27% of employees are aware and trained how to use social media, both professionally and personally. CEOs should take inspiration from leaders such as Angela Ahrendts who harnessed the power of the Millennials to drive change throughout the business and built social into Burberry’s future growth strategy. Businesses need to use thier Millenials to educate senior colleagues in the ways of social, which will then, in-turn, stimulate a change in behaviour across the wider organisation. Imogen, thanks for the comment and I agree that the update in social awareness and use in companies will be driven by our leaders of the future – the millennials.